It is just not enough that one is creative enough but one also needs the financial avenue to realize his/her dreams. In the film industry for a director to fulfill his dreams, he/she needs the right kind of production house to translate the vision on to the silver screen. And in Tamil industry, fortunately, there are quite a few producers who have understood the creative thirst of directors and have facilitated the quenching. Director Bala is one filmmaker who understands this need of his fellow directors and he, under the aegis of his B studios, will be bankrolling a film of a debut director named Raja who is trained under the legendary Balu Mahendra. 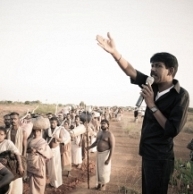 Interestingly Bala has also learnt his direction lessons from the Moondram Pirai director. Other details of this project are awaited and as always we will keep you posted. Stay tuned! Breaking: Bala and Mysskin join hands! People looking for online information on B Studios, Bala, Raja will find this news story useful.